The QNF soft lithography lab is fully outfitted for the fabrication of PDMS devices for microfluidics and microcontact printing. A complete complement of tools is located in the lab, including an ABM mask aligner and Anatech barrel asher. The lab also provides photoresist, PDMS, and all necessary supplies and tools for connecting devices to the real world. To support users, the staff provides complementary mask design consultation, hands-on workshops, and tool training. Miniaturization of liquid-based assays used in research, diagnostics and sample analysis has been gaining tremendous momentum in the last fifteen years, especially in pharmaceutical, biological, chemical, and biomedical fields. 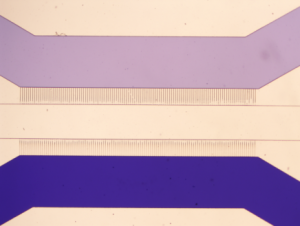 This shift towards microfabricated systems has been stimulated by the need for smaller, faster, less expensive, and easier-to-use devices that can provide higher throughput, better statistics, parallel measurements, less sample, and reagent waste, and the potential of integration with microelectromechanical systems (MEMS). This offers some unique added benefits, such as exploiting in micro- and nanoscale phenomena that are not observable in larger scales, to mimic and manipulate in vivo micro environments faithfully, and to develop single-cell or single-molecule assays. 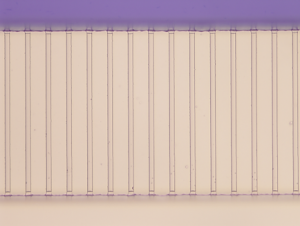 Soft lithography can be used for microfluidic devices such as particle separation, cell culture, chemical mixing and gradient generation, and organ mimetics. It can also be used for non-fluidic type devices such as micro-contact printing and force measurement on the cellular level. This is an example of a microfabricated culture device used to perform long-term neuronal culture. The channels constrain the axon growth to allow investigation of protein transport. It is easily and inexpensively reproducible and compatible immunocytochemistry and advanced microscopy such as confocal and DIC. As program manager, Eric handles new user orientation, outside user contracts, outside user agreements, coordination of user training, as well as any issues with billing. As soft lithography manager, he provides complete user training in the fabrication of soft lithography and microfluidic devices. This includes mask design, proper spin coating technique, photolithography, and device assembly.